Laser scanning is a new form of technology used to come up with accurate measurements for inaccessible areas and complex environments. It is the best way to calculate the measures of as-built conditions inside buildings. Our surveyors at our Metairie offices have adopted this technology to help create better data and visuals for our clients. 3D LIDAR (Light Detection and Ranging), or 3D Laser Surveying or High-definition Surveying, is the process whereby a reflecting laser line shines over a surface to collect data in 3-dimensions. The data collected is matched with the topographic survey elevations, sections, and plans. The main benefit of using Laser Imaging is that it helps to avoid errors or assumptions concluded when interpreting the data and avoid problems that will require consulting the original set of data. It saves on cost that could be used to revisit the site for data missed. High accuracy plans that help to avoid clashes and alterations. Reworking and fit-up problems are significantly reduced. 3D Laser Surveying helps increase the turnaround of data from the time it was collected to delivering it. The safety of workers and our Metairie surveyors improves when we use reflectorless survey methods. The animations and visuals are high quality and can be presented to you, the client, in presentations and reports. Another benefit is the changes are made in real-time, and you can view them in 3D, where the files can be converted to JPG and MP3 files. Laser imaging can be useful when trying to preserve historic buildings to avoid destroying the inside when surveying them. 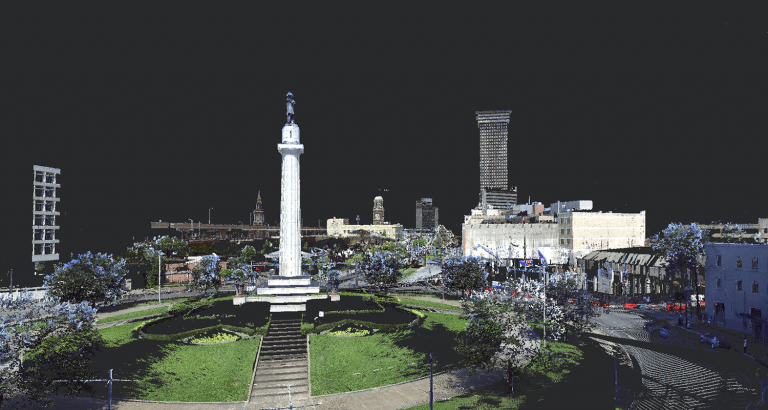 There are various tools that our Metairie surveyors can use to conduct a 3D Laser Scan. They include Leica HDS P 40 Terrestrial Laser, Global Mapper, Pix4D, Agisoft, and plenty more. The benefits of using data acquired from a laser scan are endless as departments such the Planners, Insurance Companies, Architects, Mechanical and Communicational Engineers Civil Engineers and much more can use the data acquired from laser scanning to their benefit when doing their research. There are numerous ways to get your laser scanning deliverables, both simple and complex. Our surveyors at our Metairie offices will help you get the data depending on how you want to have them. It can be in the form of cloud data, in a 2D style such as clear out sections, roof plans, and topographical plans. In 3D, it can be in animated visualizations, 3D wireframe line models in either DWG or DXF. Pointools such as PTS, POD, IMP files and BIM in Revit or in IFC to allow you to import into other BIM systems.